ONE OF THE GREATEST TECHNOLOGICAL ACHIEVEMENTS IN HUMAN HISTORY. AND A CATASTROPHE THAT CANNOT BE STOPPED. "As a Clancy fan and a former submariner I thought I was buying a techno thriller. The book stands alone. A great read with lots of interesting and thought provoking events. I looked forward to each chapter and the ride it provided. Well done!" "Right up there with Michael Crichton. Wow - where did this guy come from? Being retired and having read several hundred Kindle books, I can honestly say this has to be the most exciting heart pounding story I have yet read on my Kindle. I give it 10 stars out of 5 and - as another reviewer said "I guarantee you'll be downloading his next book.... The minute you finish this one." I sure did." "Better than Dean Koontz. Five stars. I expect great things from Mr. Grumley and am looking for his next book. Five Stars!" Something out there sounded strange. He pressed the headphones in tighter against his ears. Sonar operators were a special breed. Few people could sit in front of a computer screen, fighting monotony day after day, listening to the faintest of sounds through lonely ocean waters. But for the few who could, it was surprising how attuned a human sense could become. Eugene Walker would rather be a Ping Jockey than do any other job in the Navy. Here, he could hear everything. Even on a boring night like this, he knew exactly what surrounded them as they slid silently through the dark waters. But what he was hearing tonight sounded odd. Walker had been listening to it for some time but couldn’t pin it down. He shifted in his seat and studied the computer screen in front of him. He played the sound on his computer again and again, and still could not place it. Some jockeys were rumored to be so good that they could identify the current moving through the coral, but those guys had spent their entire lives on their boats. He couldn’t hear currents, though he had identified some natural occurrences that the computers could not. But this one was strange; a steady hum at a very low frequency and just barely within the range of human hearing. Not more than ten feet behind Walker stood Commander Sykes, reading through yet another fascinating maintenance report. Sykes was a stickler for detail, as most were, but even the best commanders eventually fell prey to the unrelenting boredom of perfect routine. He picked up his warm coffee and sipped, letting his mind wander to his wife and girls at home, wondering if they were in bed yet. He glanced at his watch absently and turned the page, now just scanning for anything that stuck out. By pure instinct, from the corner of his eye, he noticed his Navigation Officer repeatedly looking at the instruments and then back to the table and his digital map. Sykes turned slowly, still reluctant to take his eye off the report which was now blurring into a jumble of words. Sykes looked at the table and back up to another monitor, seeing the problem immediately. He took the clear rule and recalculated himself. Strange. He frowned and looked back at the young navigator. The Commander didn’t respond. He remained focused on the GPS screen, thinking. Captain Ashman replied to the knock on his door with a simple “Enter”. Sykes stepped in, his head barely an inch from the piping overhead. “What it is?” he hardly needed to look up from his own reading to know who it was. He took a deep breath. It didn’t matter whether someone upgraded the system or not, it was still broken and probably could not be fixed from here. Even if it could, it would leave enough doubt to abort the mission anyway. No one would risk continuing on and having a problem crop up at deeper depths. Down there you can’t just pop up to the surface. By the time Sykes made it back to the bridge, he was developing a bad feeling. The Cayman Islands were first discovered by Christopher Columbus in 1503. Named Las Tortugas after the many sea turtles, the islands were governed as a single colony for centuries, until they became an official British territory in the late 1960’s. Like many Caribbean islands, the majority of business in the Caymans was tourism, flocked to regularly by thousands of sunburned, overweight Americans with too much money and a penchant for cat naps. Arriving in Georgetown and setting out for adventure in their sparkling rental cars and air conditioning, most visitors would be hard pressed to spot remains of the devastation inflicted by the hurricane just a few years earlier. Progress could be simply astounding when it came to the anticipation of more money. While undetectable from the island, Georgetown was in fact still visible, albeit barely, from the 38 foot catamaran across the stretch of ocean. Anchored much closer to Little Cayman, the boat sat listless in the gentle ocean swell, swaying side to side just enough to allow the lazy halyard an occasional slap against the aluminum mast. The warm winter breeze flowed gently through the lines and over the sails, which were rolled up tight. If close enough, an observer might mistake it for abandoned with no one in sight. Though at this distance the only neighbors were seagulls, two of which sat comfortably on the port hull. A disturbance in the crystal blue water slowly appeared nearby and a ring of bubbles surfaced as a gentle turbulence. A moment later, a dark head emerged and looked around. Spotting the aft of the boat, a mask was quickly lifted over the short hair and the man swam forward. Upon reaching the small ladder, he gently tossed the mask and snorkel aboard and with surprising ease, pulled his upper body quickly out of the water, allowing his legs to find the rungs. He reached back and unbuckled each fin, tossing them up and grabbing his towel in the same motion. He retrieved a bottle of orange juice from the small refrigerator and went forward to relax on the trampoline. Peering at the larger island, he could make out the faint image of a jet ski skirting across the water. It amazed him how many people loved noise. Insistent that they need a break from the grind, they travel to a remote area to unwind, only to shop with a thousand other tourists, or zip across the bay on a rocket running at 80 decibels. He smiled to himself and tipped his orange juice in their direction. To each his own, he thought. He should, in fact, be thankful. If they were not over there, they would probably be here next to him. With that, he stood up and squinted at the glimmering horizon. Having to decide what to do every day was just the type of problem he wanted. His body suddenly stiffened. The sound was extremely faint but unmistakable and he felt a flutter of grim acceptance before reaching for the binoculars. He wiped the water from his face and peered through the lenses. He stood, watching stoically as the tiny black dot in the distance slowly grew into the recognizable shape of a helicopter. It had always surprised Chris Ramirez how busy Fridays were. He would have guessed a Saturday or Sunday, but the last day of the school week was always the busiest. This was thanks to all the nearby schools and their field trips, which meant playing host for four exhausting hours. An obligation Chris had finally been freed from just three weeks earlier with the hiring of a new tour guide. Of course, now he had to admit that giving the tours to the kids was not all bad. It was the fact that their retention levels dropped to zero once they were through the front door that bothered him. From there, they could see the aquarium’s star attractions, dolphins Dirk and Sally. Not that he would have been any different at their age. He strolled through the empty lobby sipping his coffee. As he approached, he smiled at Betty behind the information desk and his replacement, Al, who was looking over his schedule and straightening his tie. What a beautiful day these new Fridays were, now that it allowed him to return to his real work. Chris glanced at his watch; thirty minutes until the doors opened. He headed downstairs to the bottom level of the main aquarium. There, he stood before the giant wall of glass, holding back more than a million gallons of water. On the other side, the gentle rays of sun were already illuminating the water with a soft shade of blue from the tank’s open top. He watched both shadows dart back and forth effortlessly through the rays of sunlight. The dolphins were swimming about with a grace of which only they were capable. He looked higher at the third shape. It waved to him, at which point he smiled and waved back with a gentle swipe of his coffee cup. The figure turned and swam back toward Dirk and Sally. With that, Chris walked down the hall to the aquarium’s private rooms and dropped his backpack onto the desk. Swimming with dolphins was beyond what most could imagine, and she should know, she did it as often as possible. She rarely missed a Friday, as it was the one day that the aquarium opened late, leaving a forty-five minute window between feeding time and opening time. Over the last five years, Dirk and Sally had especially come to enjoy their swims together, it was more than obvious. They constantly swirled around her, letting her run her hands over their slick bodies, and in turn, would playfully bump her as they passed beneath. She looked at her watch, gave them one last pat, and headed for the ladder. Alison Shaw surfaced and held onto the ladder while she cleared her mask. She noticed a distorted shape quickly approach and looked up, removing her foggy goggles to see Chris smiling down at her. “Weren’t you just downstairs?” she asked, brushing hair out of her eyes. Chris grabbed her hand, pulling her out of the water with one hand, and handing her a towel with the other. She stepped out, quickly dried off and pulled a long sleeve shirt and shorts out of her bag. She and Chris had been friends for years, but he still snuck a glance now and then at her trim figure. A few inches shorter than average, she was still far from the norm when it came to female marine biologists. Hurrying to get her sandals on, they ran across the viewing area and into the building. They burst into the research area to find Lee Kenwood in his usual spot, at a large desk crammed with monitors and keyboards with cables snaking all over the floor, something Alison always imagined the bowels of a phone company to look like. Behind Lee and against the wall were several tall metal racks holding dozens of computer servers each. In the middle section of one of the center racks stood a monitor, keyboard, and mouse, used for manually controlling any of the one-inch thick machines, even though it was something Lee rarely had to do anymore. With the myriad of systems on his own desk, he could now just as easily connect to the servers remotely. The wall opposite the servers was part of the dolphin’s tank, constructed in clear glass to allow optimal visibility for study. Before the thick glass stood six mechanical apparatuses of varying height and complexity, with a digital video camera perched on top of each. Around the room were several dozen books and journals on topics ranging from marine biology, to language analysis, to writing code in various computer languages. “Are you sure? !” she asked looking back at the tank. She could see Dirk and Sally on the far side anticipating the first wave of children. “What about Inter-click Interval and Repetition Rates?” She scanned the large monitor excitedly. “Well, when you come down off of cloud nine, maybe you can spare a few minutes…we’ll need someone to write us up a press release.” With that, he let the door close behind him. The silver doors opened and John Clay stepped out of the oversized elevator. With a sharp right, he made his way down the long white hallway of the Pentagon’s D ring. From the far end of the hall, Admiral Langford spotted Clay and broke off his conversation with another officer. He walked to meet him and handed Clay a thick folder. “Sorry, Clay.” The admiral was shorter by a couple inches but moved erect and with a sharpness that always made Clay feel he was looking up. They met several years prior when Admiral Langford took over the department. He’d been under Langford ever since. “No change in direction. Same course but fifteen miles further out.” Langford could see the problem taking hold in Clay’s head. Clay was one of the best analysts he’d ever had, with a mind like a steel trap. Langford never had to repeat anything to him. Clay spoke without realizing it. “Those sats are all semi synchronous. A GPS receiver is never locked onto the same six signals. Which means by now-”. The Department of Naval Investigations was a large department and took a large part of the Pentagon’s second floor, rings A through E, on the west side. Consisting of several hundred staff, most specializing in legal and personnel issues, the department was growing as a result of the softening of military policies. Personnel issues such as harassment had skyrocketed over the last several years as the military struggled to adapt to twenty-first century expectations. Next to legal and HR, the Navy’s technology group was small by comparison. Clay’s team was smaller still. Electronics and Signaling was a specialty that very few understood, let alone were interested in. Even the brass, who were often technology’s strongest advocates, did not really want to know how. They just wanted it to work. Clay’s E&S team often had to find out why a technology was not working, where the failure occurred and why. It required expert level knowledge in a wide variety of technologies including computer chip design, networking, signaling and a thorough understanding of the electromagnetic spectrum. Clay turned a corner and passed a number of offices. His aide, Jennifer, was clearly expecting him when he opened the door and walked through. She grinned and followed him with a folder of her own. “I’ll be sure to cross it off my list.” Jennifer laid the folder out and set aside his stack of messages, which Clay eyed with dismay. “Oh stop. You’re going to give her a big head.” They both looked up to see Steve Caesare in the doorway, smiling. At six foot, with matching dark hair and mustache, he was one hundred percent Italian but without the ties to the mob, or so he said. Caesare and Clay had been friends since the beginning, meeting in the earliest days of their now twenty-two years of service, and working through most of those years and several departments together. Jennifer smiled and left the room, flicking him on the arm as she passed. Will Borger was a true throwback from the hippy generation, though technically a few years too young to actually qualify. He wore his hair long in a ponytail, likely trying to make up for the top of his head which was losing ground. He routinely wore round glasses and loose fitting Hawaiian shirts. He was the epitome of the old computer geek and Clay and Caesare liked him immensely. The two walked into the lab, filled with computer and satellite equipment, some so complex that it was almost unrecognizable even to them. Most of the shelves were a tangle of wires and cables, connecting dozens of monitors, computers, oscilloscopes, and amplifiers. Clay estimated that Borger had enough coax cable in his office to start a television company. A wooden desk sat in the corner under an old lamp with almost a dozen keyboards, some stacked on top of each other. Clay was familiar with the Jason-2. Replacing its predecessor, the Jason-1, which itself replaced the TOPEX/Poseidon, the first satellite designed to study the planet’s magnetic field. Those early missions had changed how satellite computer chips were designed and significantly increased their ability to withstand high doses of solar radiation, resulting in a boon for the satellite industry. Yet, while the first two returned a wealth of information, the Jason-2 was the first craft sensitive enough to detect fields closer to the surface. He recalled the launch creating quite a bit of excitement among the scientific community. Four hours later, Caesare walked in and dropped a thick stack of paper on Clay’s desk. Alison sipped her tea and stared intently at the screen. It was about to start, and she could almost hear her heart beating. What’s with the anxiety? She thought to herself. You’d think you were the one on television. She was rarely nervous, if you could even call this nervousness. It was more excitement than anything else. Her press release had been picked up by dozens of papers and news broadcasts, all wanting an interview. She would never have imagined that kind of response, but with the progress they had made recently, maybe it was not so surprising. What was surprising, was that they managed to make it on television and quickly. NBC called and wanted Dubois to be part of their Monday show, just three days after their press release went out. Previous announcements, albeit less exciting, had only been picked up by local papers. Something about their latest news sure got somebody excited. It made Alison wonder who got bumped. Hopefully some corporate executive lined up to hype a new product line or brag about how much richer they were. She shook her head and bobbed her tea bag a couple times. “You know you should have gone with him,” he said, taking a tentative sip. She raised her cup to hide the grin. “Thank you, Matt.” Frank’s face filled the screen and both Chris and Lee let out a whoop. He looked good, comfortable on camera, much better than she would have. “It’s a miracle,” Chris mumbled under his breath. “Stop it!” She blushed and stared back at the screen. Accepting compliments was not her strong point. “And what does IMIS mean? “And this IMIS translates the language?” asked Lewis. “Really?” Lewis was genuinely surprised. “So, if you are able to translate, what will you say? Obviously, you’re not going to ask them what it’s like to be a fish.” The audience laughed. Alison watched the salesman emerge in Frank. This was how he got their funding year over year. He was a god. “Thank you.” Frank smiled and shook. Alison smiled, her fingernail still between her teeth. Not bad, she thought, not bad at all. Thank you for reading Breakthrough. This FAQ page is a small supplemental to the book, and answers common questions by readers. Please note that this page contains SPOILERS to the book, so if you have not read BREAKTHROUGH, please do so before continuing. A: Most definitely. I’ve just completed my next book AMID THE SHADOWS which should be available shortly. Next, I will begin work on BREAKTHROUGH’s sequel. Q: What happened to Clay after he went through the portal with the bullet? A: Clay was in fact shot in the process. He was able to maintain consciousness for a short time, and with the help of Palin’s people, his life was saved. He awoke only shortly before returning to D.C. with Palin. Q: How did Dirk survive the nuclear explosion in the end? A: John Clay traveled through the portal and was able to warn Palin’s people before losing consciousness. They were able to find and identify Dirk, but did not have enough time to intercept and disable the warhead since it was pre-programmed. The best they could do was to protect themselves from the blast and teleport Dirk out from under the bomb before it detonated. Q: How could Stevas launch nuclear missiles without the President’s authorization? A: Stevas never actually launched nuclear missiles. The submarine attack on the ring was a torpedo attack, and they were traditional torpedoes, not nuclear. What Stevas did do however, was take advantage of the confusion and claim he was acting under the President’s authority, and manage to procure a small tactile nuclear warhead (of which the US Defense Department has many). That was the warhead that was strapped to Dirk. Q: What happened to Neri and his village on the island of Tristan Da Cunha ? A: What Neri discovered near his fishing hole, was an energy portal with footprints leading out. When Neri’s mother spotted the missile overhead and pushed him inside, she noticed the sky and surrounding buildings looked unusually blue. This was because Palin’s people had reached the island in time to place a protective dome over the small village, allowing them to survive the blast. Q: Why was Palin’s son on the Pathfinder ship? A: Palin’s people were well aware of the episode the Alabama sub experienced near their ring, and they knew there would be an official investigation. 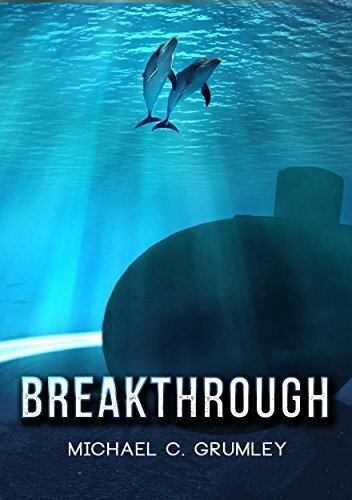 They later snuck aboard the Pathfinder ship in an attempt to find out how much Clay knew, and more importantly whether the dolphins had already revealed anything about them. Q: Why didn’t Palin’s people just teleport him out of jail? A: Teleporting is not that simple. There needs to be an energy source on the other end when used over a significant distance. The silver cube that Palin’s people carried was that energy source. In an emergency it acted as a life saving device. You will note that the small portals only opened when the cube’s host was near death. However, in the case of Dirk, he was close enough that they did not need a cube to teleport him. Q: What happened to Stevas? A: That’s a very good question.